The craft of Kokedama came to life in reflection of the Japanese mindset of Wabi-sabi, which is the art of finding beauty in imperfection and revering authenticity above all. Kokedama encompass the aesthetic of Wabi-sabi, which includes characteristics such as asymmetry, simplicity, warmth and natural beauty. Traditionally, kokedama are displayed on driftwood or handmade pottery. Today, displaying kokedama as string gardens has become a trend in Japan, and is becoming increasingly more popular in the US - coupling several hanging kokedama creates a particularly dramatic effect. These living sculptures can be displayed indoors or outdoors. Kokedama require watering and care like any other houseplant would. 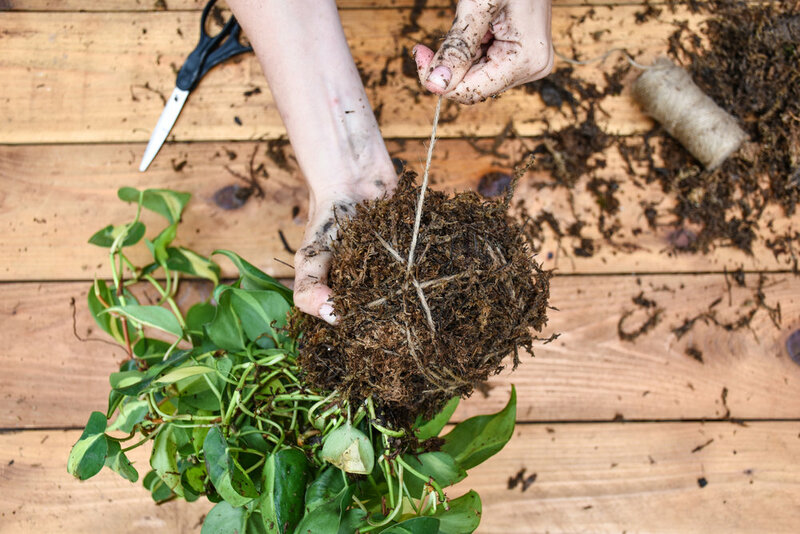 Most kokedama require a watering about once per week, but it is imperative to adjust your watering schedule to your suit your specific plant's needs. These beauties typically work best indoors, under a porch or hanging from a tree. Choose plants that are not extremely dependent on daily watering. Hardier plants are better for this planting application. Follow these easy tips to help your string garden to thrive. Suggested kokedama plant choices: ferns, ivy, shade-tolerant grasses, pothos, asparagus ferns, philodendron, herbs or african violet. Proper lighting for kokedama is on a plant by plant basis, but care should follow the the care instructions typical for your plant selection. We typically craft kokedama for interior spaces, choosing well lit rooms and plants that do well in those lighting conditions. A great ‘starter’ is a pothos kokedama. Easy care, dramatic look and it can do well in lower-light or bright light situations. When watering kokedama, you’ll have to adjust your watering schedule according to your specific plant’s needs. Our favorite watering method for kokedama is soaking. 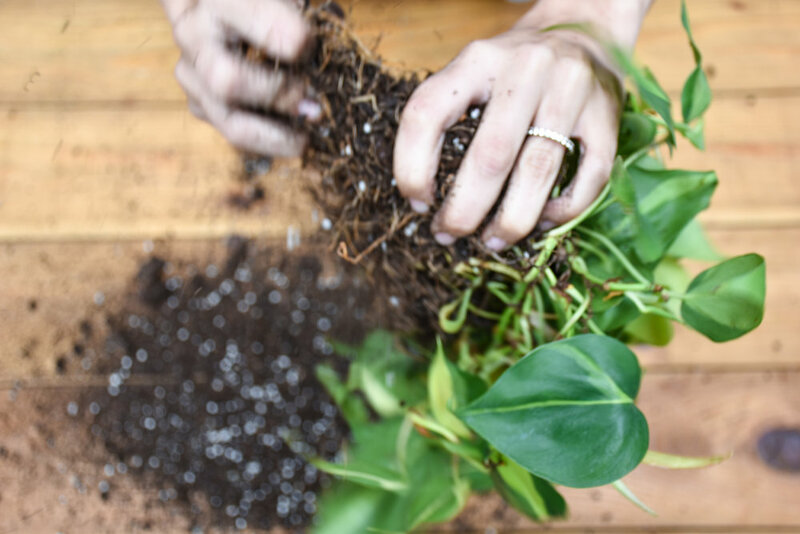 Keep in mind, the roots of your plant are in the center of layers of of soil and moss, this central root area must be completely soaked in order for the plant to receive proper hydration. The soaking method allows the water to travel to the center of the kokedama, appropriately watering the root system. Once the water has soaked to the center of the kokedama, the layers will act as insulators, keeping the roots moist as your kokedama is on display. 1. Depending on the size of your kokedama, fill a bowl, sink or tub with room temperature water. 2. Place your kokedama plant up into the bowl of water. Let it soak for 30-45 minutes. 3. Remove from water and let dry before returning to its home. 4. Water again when the kokedama ball feels relatively drier and lighter. Tip: Water must seep to the center of the moss ball to water the plant, so make sure it is soaked thoroughly. We offer private & community kokedama workshops to share the joy of this ancient craft with fellow garden enthusiasts. Meet us, our team and learn how to make these works of hard in a hands-on, meditative and inspiring environment. We'll teach you the proper methods of construction, care and styling to create the string garden of your dreams. Join us for one of our community events in New Orleans, or book us for a private event. These green events are ideal for parties, team builders and groups looking to connect with nature in a creative way. We'll bring everything you need for a botanical experience that inspires growth. 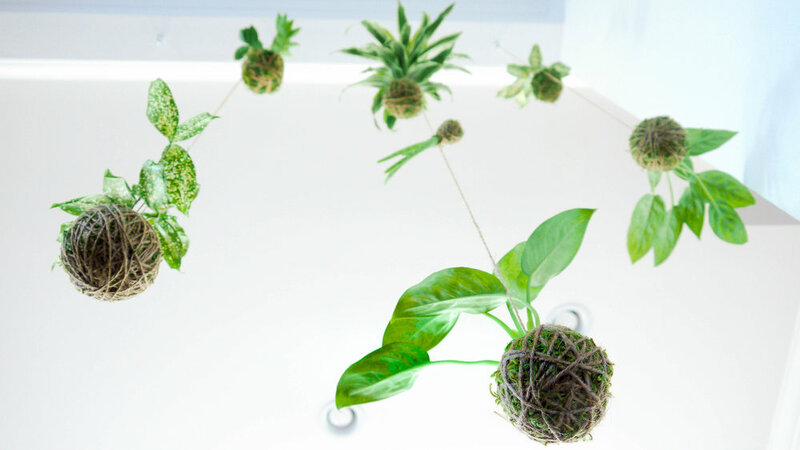 Imagine a variety of your favorite houseplants encompassed in moss balls, floating mid-air within your space. Pothos, ferns, philodendrons, herbs and citrus are all possibilities for the floating garden of your dreams. Crafting and caring for this suspended oasis is not as far fetched as it seems. The Japanese art of Kokedama is an ideal planting method for small spaces and creative botanical displays, and opens up a world of meditative gardening possibilities that embrace the beauty in simplicity. Traditionally, kokedama were displayed on small dishes or ceramic trays. A more modern approach hangs kokedama from the ceiling or wall, creating a whimsical floating effect. The latter is our favorite method, and gives us endless options in creating stellar botanical installations. Below are Luna kokedama creations and installations. We hope you feel inspired to craft your own living art!